If you read my article on finding SQL Server instances, you’ll know that I mentioned that I planned on writing a series of articles around a code generator that I have been playing with off and on for the last couple of years. Since this generator was designed to create class definitions around tables, views, and procedures in an SQL Server database, I needed to figure out and write the code to get schema information from a given connection. As it turns out, ADO.NET provides a fairly robust mechanism for implementers of data providers to return this information from the underlying data store. In this article, I will be focusing on the information available from the System.Data.SqlClient namespace – but, techniques shown here apply to all of the data providers built into the .NET framework. I have similar code using System.Data.OracleClient that I can provide if it is of interest. I’ll start off simple and create a small C# console application that can list all of the databases in an SQL Server instance. The key to the above codes success is the SqlConnection.GetSchema method. By passing in a string that represents the name of one of the provider’s supported schema collections, you can get a DataTable back containing the requested information. There are essentially two types of schema collections – Common Schema Collections and Provider Specific Schema Collections. As the names imply, the common schema collections are the schema collections implemented by all of the .NET framework providers, where as the provider specific collections apply to a specific provider. You can find a lot of information on using the GetSchema method and the various schema collections here. So, now that we’ve introduced the concept GetSchema and schema collections, let’s do something a little more complex. 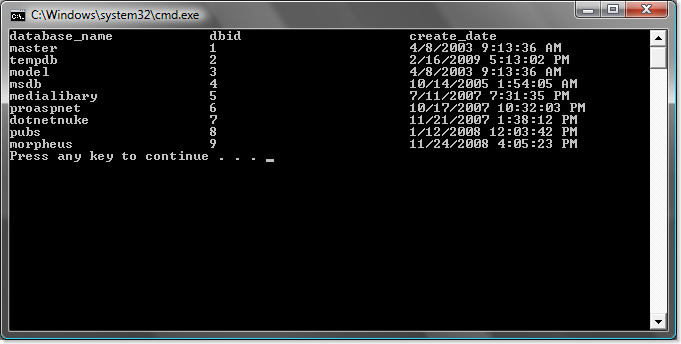 Let’s build a database explorer type control. 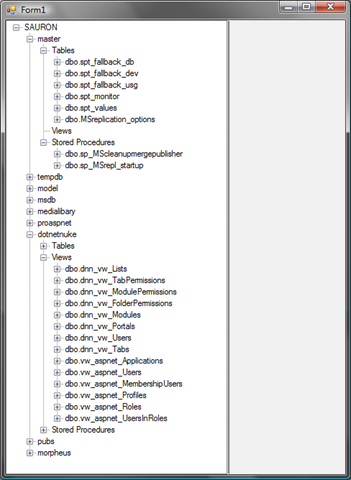 Something like a very simplified version of the Object Explorer in SQL Server Management Studio. 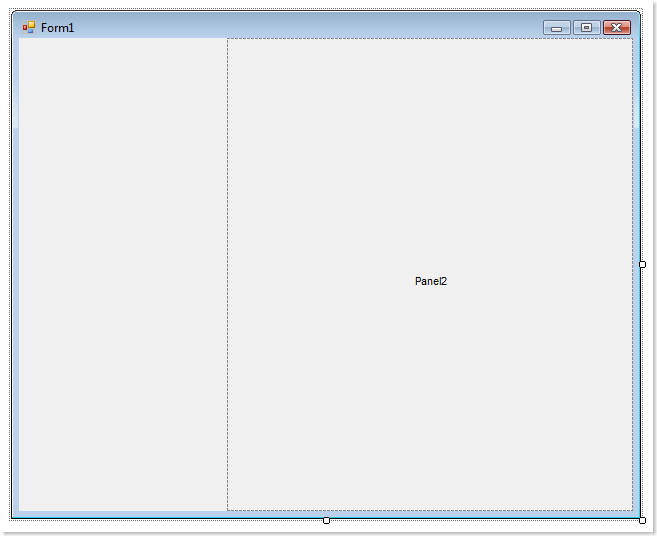 Start Visual Studio, and start a new blank solution. 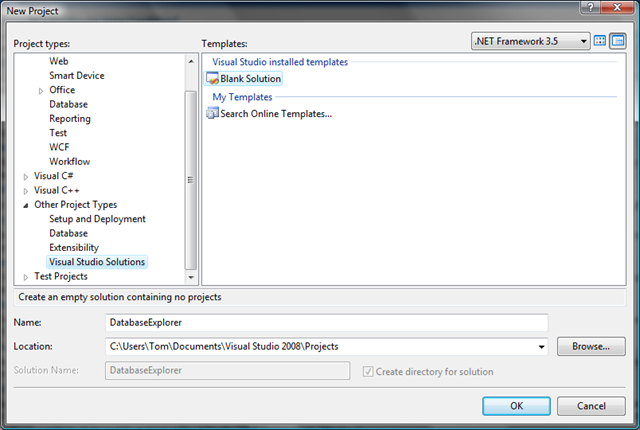 Do this by selecting File -> New -> Project and then selecting "Other Project Types -> Visual Studio Solutions" in the "Project Types" tree view in the "New Project" dialog. Add a Windows Forms application to the blank project to serve as a test harness for the control. 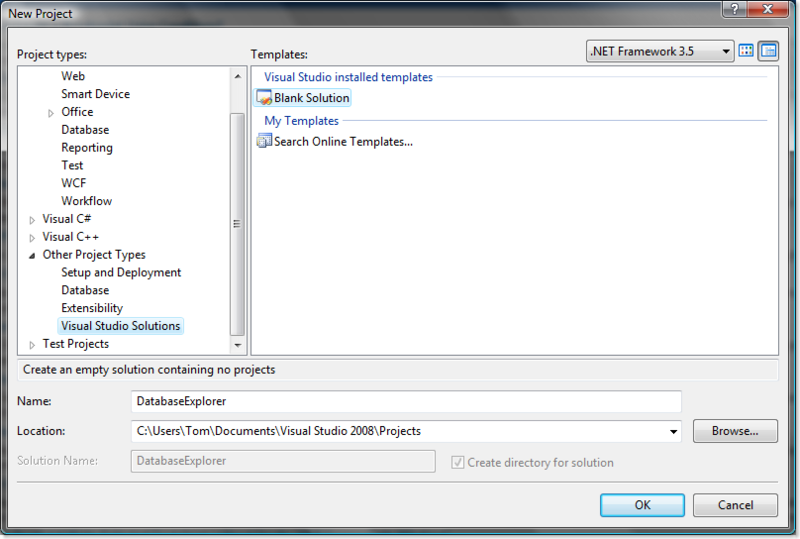 Right click on the solution in "Solution Explorer" and select "Add -> New Project…". Now, following the same steps as before, add a new "Windows Forms Control Library" to the solution. 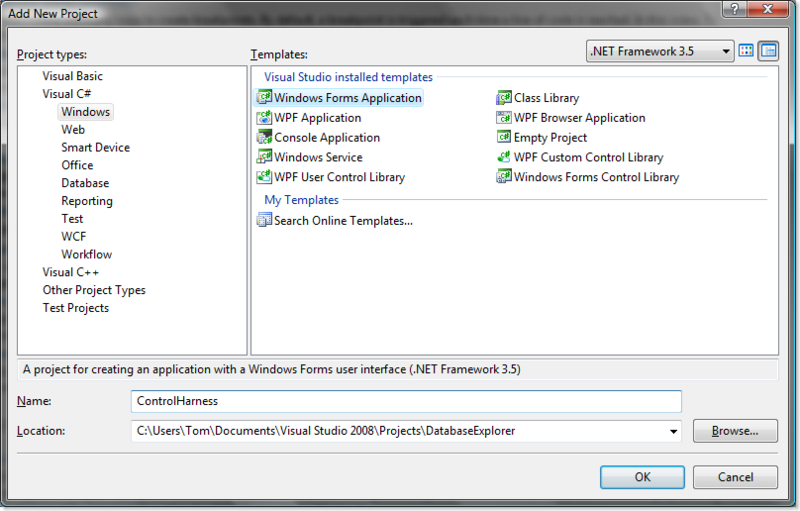 In the windows forms project add a reference to the control library project. To do this, right click on the windows form project in the "Solution Explorer" and select "Add Reference…". 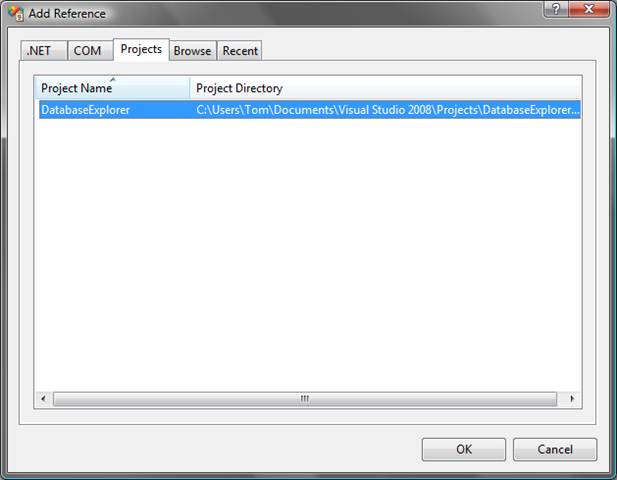 Select the control library on the Projects tab of the "Add Reference" dialog. 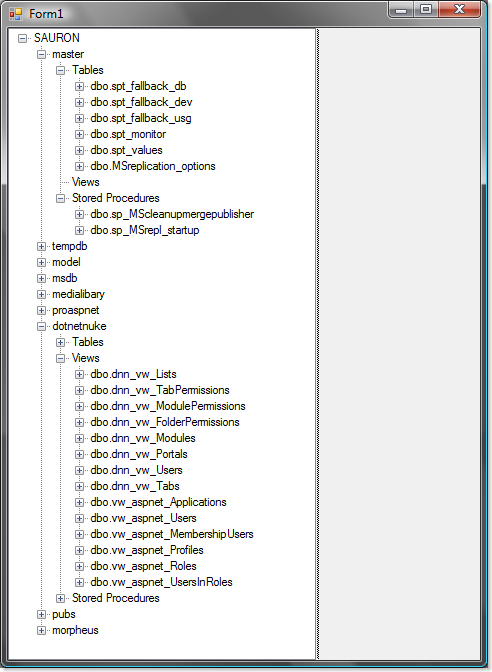 Select OK.
Rename the default UserControl1 in the windows control library to something more appropriate. The easiest way to do this is simply right click on the control in the "Solution Explorer" and select "Rename". I called mine "DBExplorer". Compile the solution. Now, we create a simple interface so we can see the control in action. 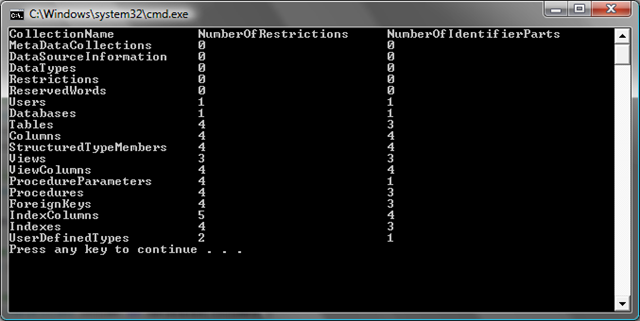 I added a SplitContainer to the default Form1 in the windows forms application. 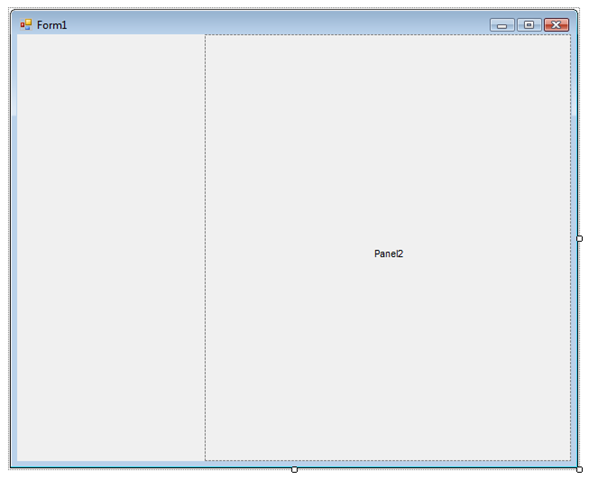 Then added an instance of the DBExplorer control to Panel1 of the SplitContainer, and set it’s Dock property to Fill. 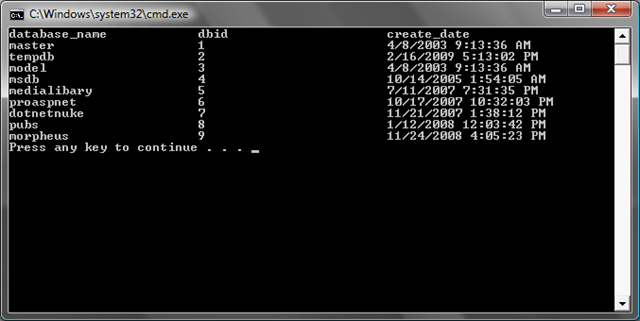 I named the DBExplorer instance uxDBExplorer. 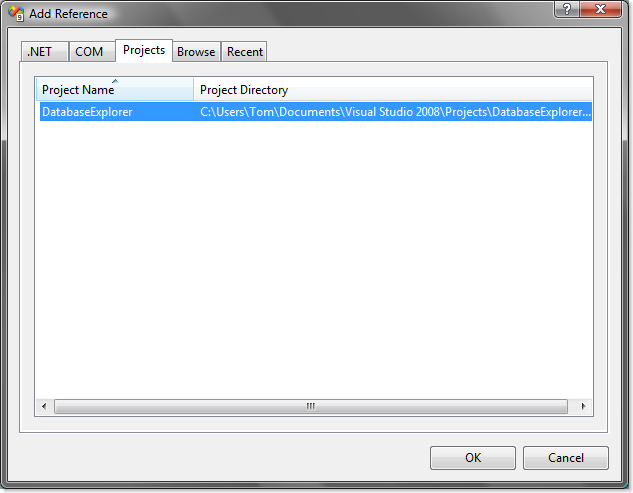 Go back to the control library project and add a treeview control to the DBExplorer interface. Set it’s Dock property to fill and give it an appropriate name. I gave mine the name of uxExplorer. Compile the solution. 131:         /// Node whose text property contains a database. 187:         /// Node to store information about tables and views. I purposefully left the implementation of gathering field and parameter info to the reader – but, I hope that this was enough to introduce the key concepts of using the GetSchema method of the SqlConnection class to dynamically discover schema infromation. 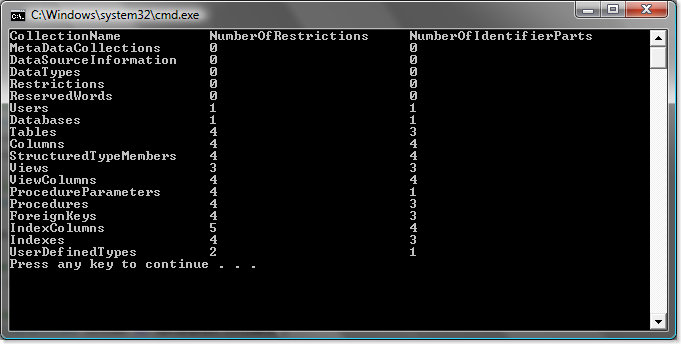 In the entity generator that I have been discussing, I use a variant of this exact control. The major differences being that it supports multiple connection nodes and displays images for the various database objects.